Female-fronted loud indie rock with punk momentum, Kill Rock Stars' Bangs is one of the sharpest, fiercest, most energetic rock albums of 2000. Catchy hooks, sharp lyrics, and vocals with a distinct, appealing edge, Sweet Revenge is THE rock album of the summer. Forget those who say indie rock can't be loud and bold; forget those who believe indie rock is timid and weak music recorded in a lo-fi basement somewhere with nothing going for it beyond its "coolness" factor. 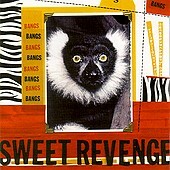 Bangs' Sweet Revenge proves the non-believers wrong track after track. The raging guitars, the bouncy drums, and the earth shattering bass shake and wail, serving up plenty of momentous rock that just refuses to give up. The lead vocals deliver angst and excitement in equal amounts, managing to release tension and create fun within the same bar. Usually it takes me a while to get into an album. Even some of my favorite albums took me a few listens to have them really grow on me. But from the opening of Sweet Revenge I was blown away. This is exactly what I was looking for. Rock with attitude and substance, not to mention style. I'll give it an A+.